June is here and it only means one thing. SUMMER! That’s why this month our Moodboard reflects the summer feel. With bright warm colours, flowers, ladybugs and fell of a beautiful weather outside. Another stunning mood board with so much inspiration. So bold and daring, I wanted to do it and push myself out of my comfort zone. Reds are a hard colour to pull off, But I love how these tags came out. I was deciding between the Yuletide collection and the Domestic Goddess collection, after much thought I went with the Domestic Goddess. The colours match perfect with the inspiration colours. I took inspiration from the flower photos, and added the flowers on the tags to focus on the centre portion of each tags. After using some background stamping with the Lost and Found and Northnern Lights clear stamps. I used the Wonkey Halftone Mask to get the texture and feel. I hope this inspires the creative flow. I also made a video of the creative process and evolution. 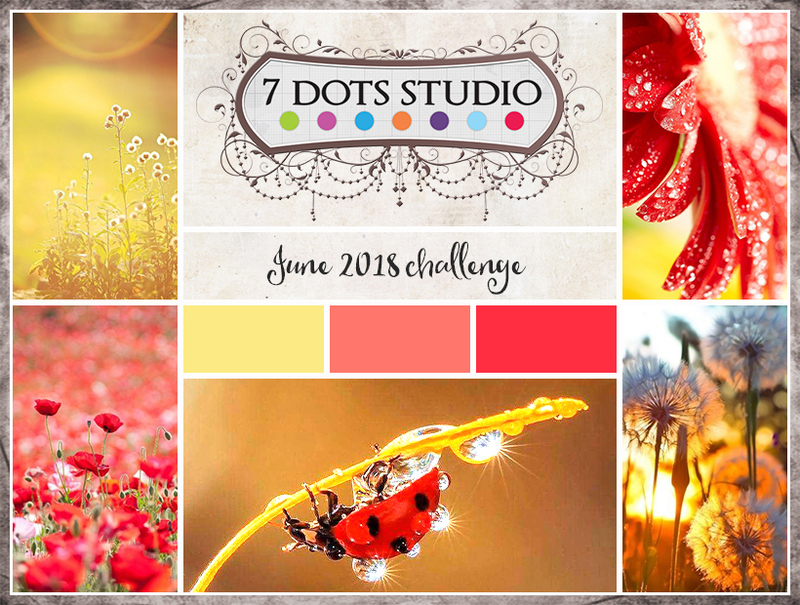 Wonderful, colourful and energetic June Moodboard inspired me to create two cards – one can say – with greetigs from a meadow. I believe that our great challenge will also inspire you to create amazing projects. 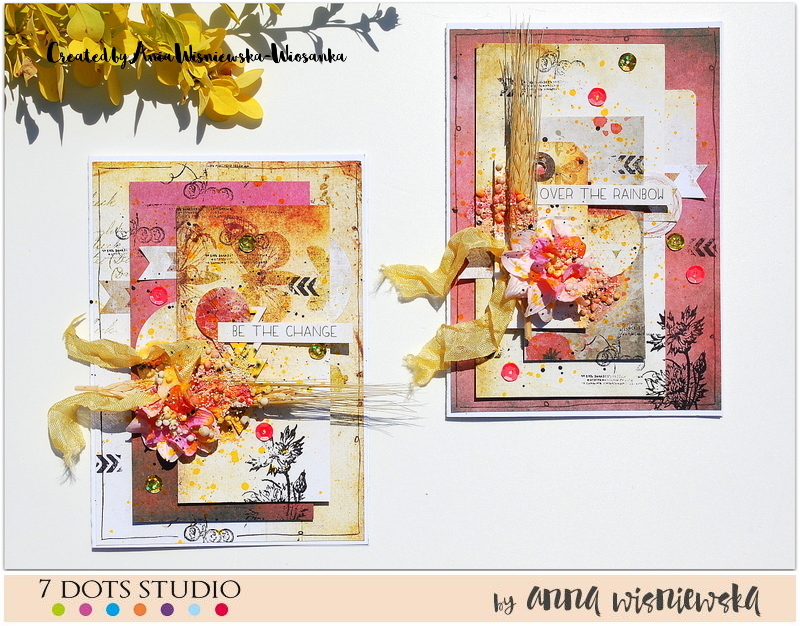 To make this cards I mixed two 7 Dots Studio collections – Homegrown and Dreamscapes. 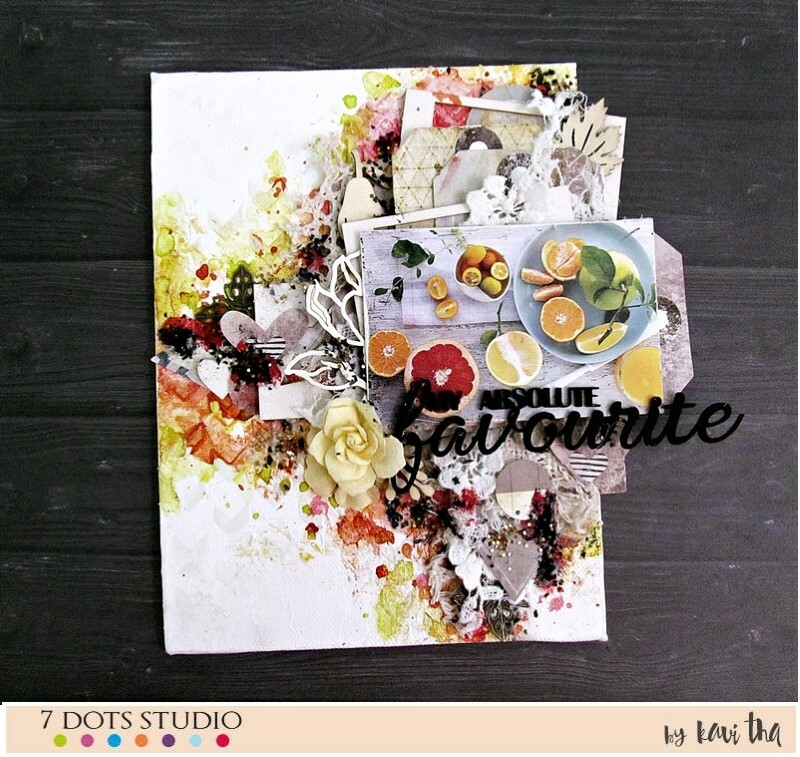 The bright yummy color palette reminded me of fruits,so i decided to make a canvas using some of my favourites. I have used some tags and elements from “Dreamscapes” collection. I have also added some circle elements and flowers inspired by the Moodboard. I spend as much time as I can outside – in the garden or walking. I love being among nature. 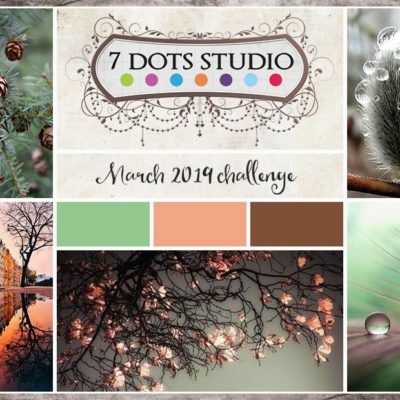 This month 7 Dots Studio moodboard inspired me to create a layout with a photo I took during one of the beautiful summer day, when I wandered daydreaming. 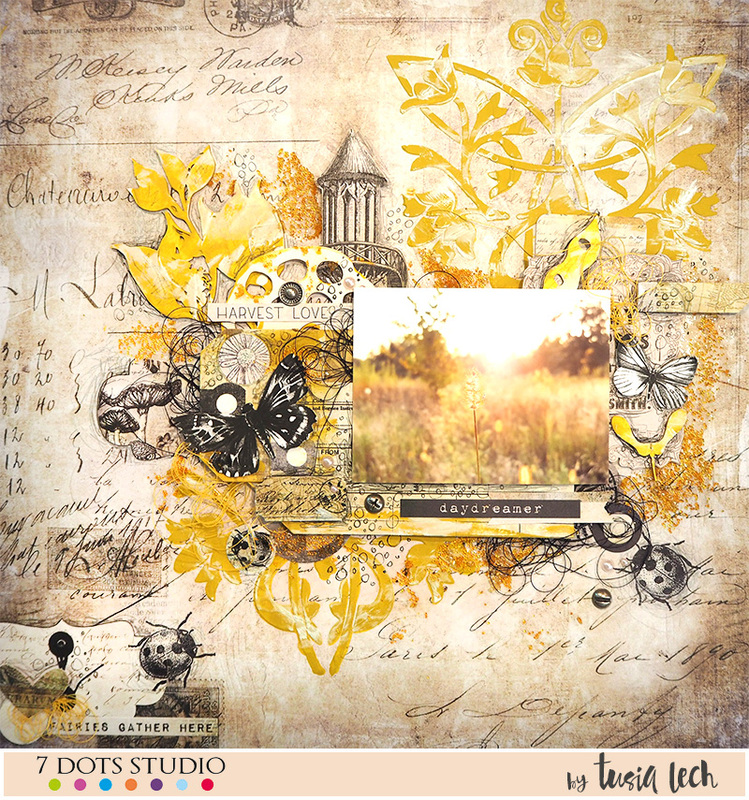 I have used two new 7 Dots Studio collections: Air Mail and Garden Party. You can buy them both in 7 Dots Studio store. I started by creating background using new Garden Party Floral Knot Stencil and a mixture of Lemon Peel Impasto Paint and ArtAlchemy Ancient Coin Paint. I used this mixture also for colouring the Garden Party chipboard. 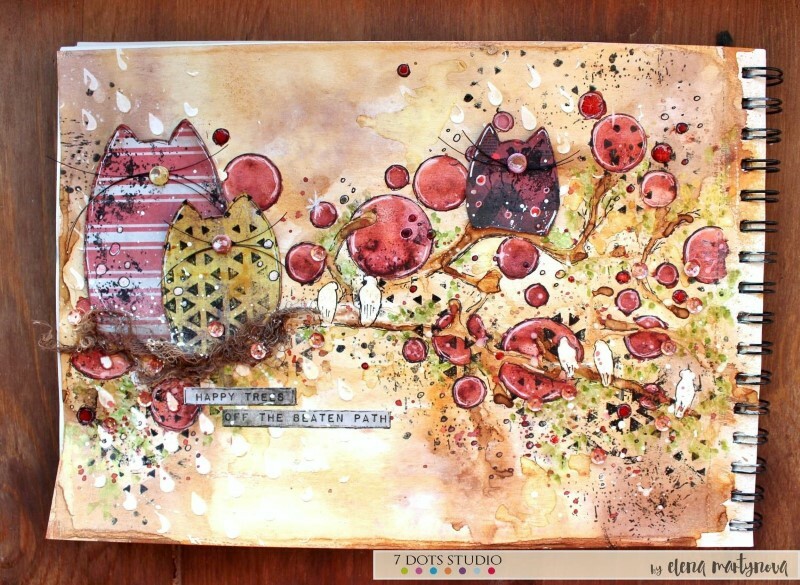 Than I started creating layers using 7 Dots Studio Air Mail and Garden Party papers and stickers. I love using thread and microbeads, so you can see both of them too. My project wouldn’t be complete without some doodling. Most often I use black pen and soft pencil. Beautiful butterflies are fussy cut from Garden Party Born paper and cute ladybirds are stamped using Garden Party set of stamps. Hello friends! 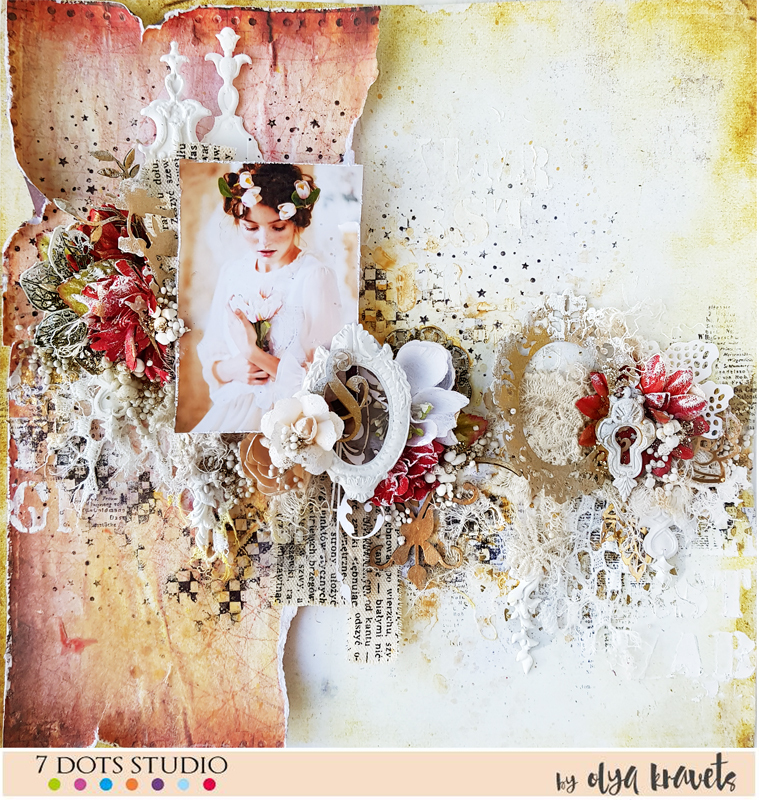 These new Moodboards are so stunningly beautiful! Feels like summer and gentle mood, it’s wonderful. I also wanted to convey a little juiciness and tenderness in my project. Here I counted two incredibly beautiful sheets: “Dreamscapes – Narwhal” and “Domestic Goddess”. Challenge is open till June, 30th midnight CET. We announce winners on the 5th of July. 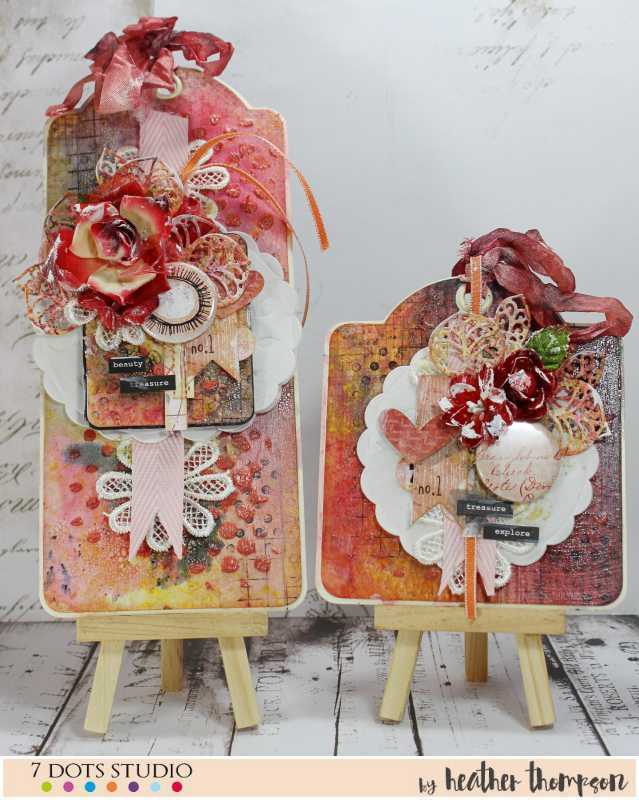 The main winner is going to win One Collection Kit and one 6×6 Pad from our New Collections!